One of my favorite things to make around the holidays is fresh wreaths. They’re fairly simple and lend such a lovely touch to any wall, mantle, door knob, or table. Really the possibilities are endless. 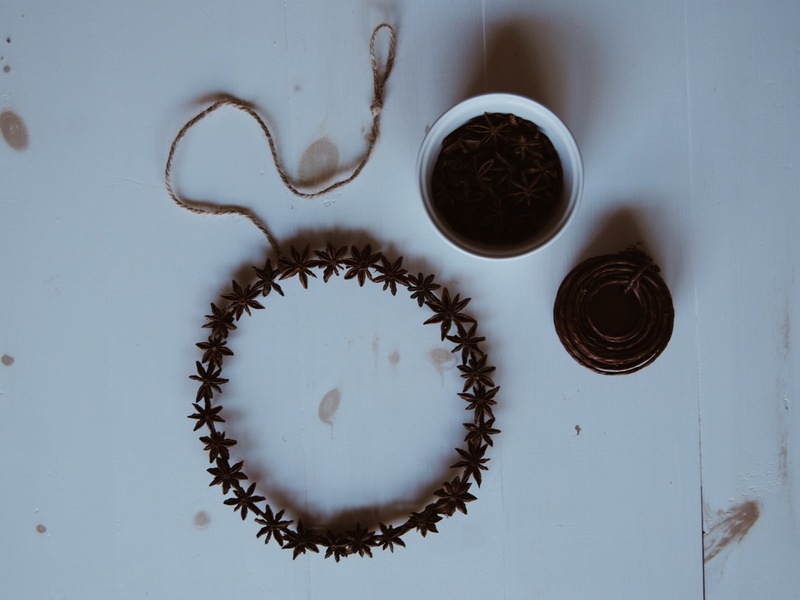 You can make them from tree clippings, store bought boughs, or even spices, as is the case with this simple star anise wreath. I love this particular wreath because it suits my simplistic, neutral aesthetic and has a lovely scent if you like anise. If not, don’t worry, it wears off after a while. You may even be able to rinse the stars first and let them dry to get rid of more of the scent. You don’t need much for this easy craft and what you do need is quite inexpensive, two wins in my book. If you have kids they can easily help you by sorting through anise for pretty stars, handing them to you while you glue, and helping you find a place to display it when you’re all done. You can also easily alter the size and shape to your needs. I made an 8″ circle, but you could make it smaller or larger, or change up the shape and maybe do a square or star instead. 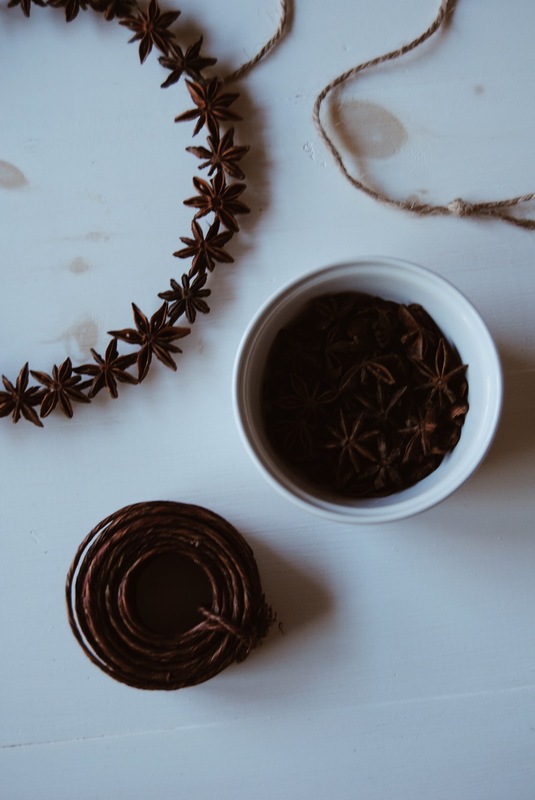 Begin by emptying the anise packets into a shallow bowl or plate and sorting them into three piles- intact starts, possibly usable part stars, and little pieces. You can discard the little pieces or save them for making mulled wine or spiced tea. Use the whole stars and create the desired shape of your wreath on the table top. This will help you estimate how much wire you you will need. To do this, I simply held the wire over the circle of anise until I had it about the same size. Then I added about 6″ extra so I could secure the shape by wrapping the ends around themselves a few times. Once the wire form is ready to go you can begin gluing on the anise, putting a little dab of glue on the back of each star and holding it onto the wire form for a few seconds while the glue hardens slightly. Work your way around until you’ve reached the beginning again. Use the partial star pieces if you have a gap to fill at the end. 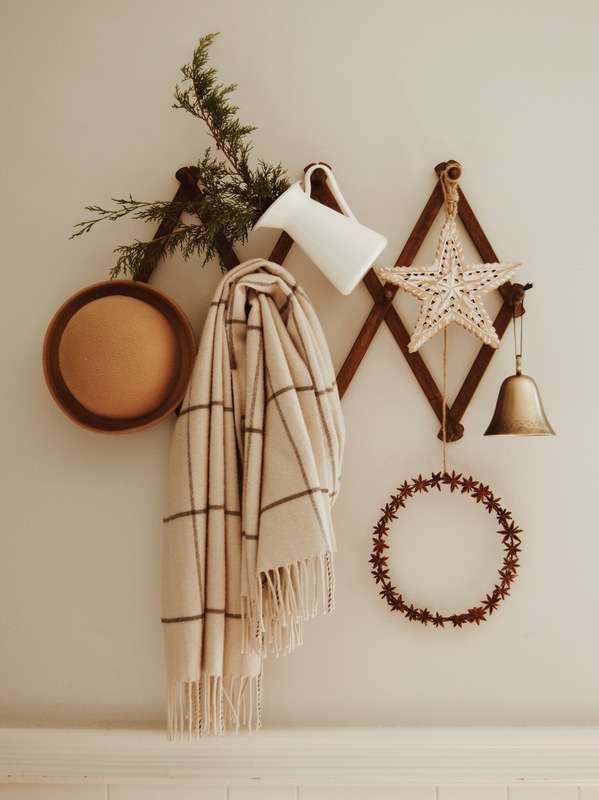 Decide where you want to put the completed wreath and if necessary add a length of ribbon or twine for hanging. And that’s it! The best part is if you treat it gently it will be ready for next holiday season, too!